Want the “absolute sound” at a reasonable price? Let us turn your vintage tube amp into a classic masterpiece! However, this 50+ year old technology is often in serious need of restoration. They are usually full of distortion, hum and noise, and sound nowhere near as good as they should. Even worse, due to the high voltages used, they can be hazardous to operate without proper servicing. Don’t deprive yourself of the ultimate listening experience your vintage amp is capable of. Let us bring it back to better-than-original factory specs; ready for many more years of top-level “audiophile” performance. With prices climbing for vintage tube amplifiers, restoring your vintage amp is money well spent. AEA has a very special history related to vintage tube amps: Saul Marantz and Avery Fisher were both members of our Advisory Board in the late 70’s. These giants of the tube era personally shared technical insights with us that are reflected in how we restore and modify vintage gear, as well as how we design new gear. We go well beyond the typical amplifier “recap/servicing.” Our years of experience and attention to detail give us the ability to completely transform your vintage amp. From ultrasonic corrosion removal to our list of performance upgrades, your amp will not only look beautiful, it will sound beautiful — becoming an asset that appreciates in value. We begin by removing the face plate and stripping down the chassis to the component level. The transformers are removed, tested, repaired as necessary and even repainted as requested. Next the entire chassis is ultrasonically cleaned using our proprietary method to remove the years of built up corrosion and tarnish from not only the chassis, but also from all wiring, connectors and controls. Our’s is the only method in existence that cleans the outside and inside, of every connector, switch and control, well as all of the circuit wiring and solder connections. The result is like putting in all new wiring, switches and controls. Read more on our “Ultrasonic Cleaning” article. After ultrasonic cleaning, the chassis is dried in a special dehumidifier for several hours before all solder joints and components (including resistors) are checked. All switches and controls are lubricated and adjusted. Before reassembly, the chassis and face plate are thoroughly hand cleaned and the transformers buffed. If hand polishing is ordered, we hand polish the chassis, face plate and knobs to a luster seen on the amps we sell in our store. Your cosmetically restored amplifier is then coated using state-of-the art silicon finishing compounds to protect the chassis and face plate from corrosion for years to come. Your amplifier is then put on the test bench to generate our full diagnostic Amplifier Performance Report. From this point on, the sky is the limit as to what we can do to your amplifier. To keep costs to a minimum, we offer all our upgrade services as a self-contained package. This means you get everything we have deemed necessary through our years of experience performed on your amplifier to maximize performance for dollar value. See our Performance Upgrade Packages below for more details. Any upgraded amplifier receives a critical listening session where we A/B it against our set of reference amps. This is done in listening rooms specially equipped with A/B switching for “live comparisons” in addition to several different speaker systems; allowing us to thoroughly audition your amp’s sonic performance. If your amplifier doesn’t pass this final test with flying colors, it’s sent back to the lab for more work until it does. Read more about our listening rooms on our “Listening Room” article. You would expect to pay many thousands of dollars for a new amplifier that can match the musical quality and faithfulness to accurate reproduction these modernized classics can achieve. And that new amplifier would undoubtedly be a tube amplifier. 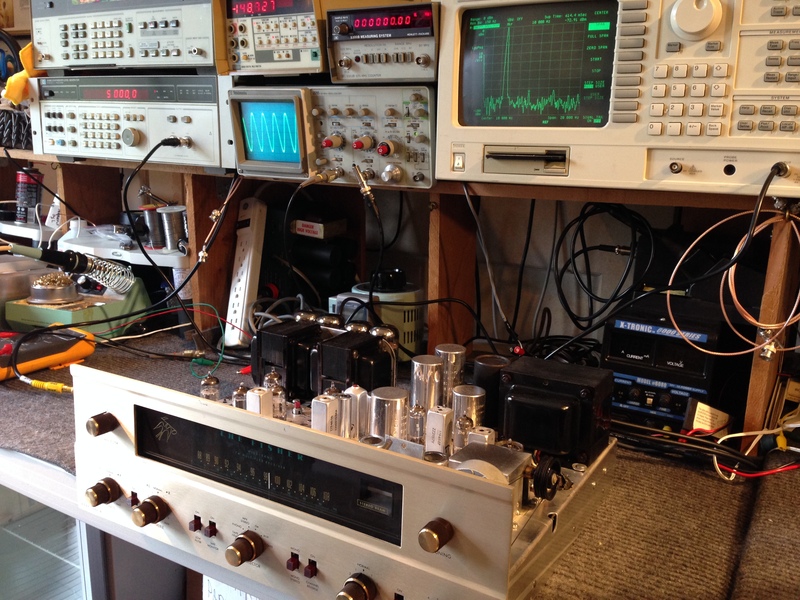 Once the restoration and modifications are completed, we thoroughly test your amplifier using Hewlett-Packard laboratory quality instruments in addition to our own patent pending computerized analysis. During this process we measure and diagnose the electronics of each amplification stage. The phono preamp is also tested to meet original RIAA equalization and noise specifications. Tarnish and corrosion are removed with a transformer out, face plate off, ultrasonic cleaning. All contacts, sockets, and internal wiring / components cleaned. All controls are subsequently re-lubricated. Amplifier is sealed with silicon compound to help prevent future corrosion. Our signature show quality hand detailing of your chassis, knobs, and face plate. This is an excellent addition to ultrasonic cleaning, as we will already have your transformers removed from your chassis. Includes repainting of transformers if needed. Restore full original operating voltages, reduce hum and increase power supply stability for improved sound quality. We replace all power supply filter capacitors with modern low-ESR high temperature types made by Rubicon, CDR or Nichicon. Upgrades power supply capacitor values by 50 to 100%. Additionally we add polypropylene film capacitor bypass. We replace all your old and possibly leaky signal path capacitors with modern “audiophile” quality capacitors – greatly improving sonic performance and reducing distortion. End tube matching problems, lower distortion and improve power response. Reduce your output tube replacement costs. We add critical bias adjustment circuitry for each individual output tube. This allows us to optimize each tube’s bias for the best possible Total Harmonic Distortion with the lowest odd-order harmonics – a must have! Improve sonic quality by maintaining exact bias settings, driver stage balance and operating voltages at all times, under all loads and varying AC line voltages. Our AEA 510 moving coil cartridge phono preamp and AEA 520 preamp were legendary in their time for phono performance, besting the best in tube phono preamps of the day. Let our phono preamp circuitry expertise create the perfect phono stage for your amp to lower noise, reduce distortion and improve frequency response. We can also match input impedance specifically for use with your preferred cartridge. Greatly extend tube life and reduce harmful inrush currents that degrade components throughout the amp, including capacitors and resistors. We install a SCR based high voltage delay. No relays used. Electronically delays application of high voltage until your tubes reach operating temperature. Nothing is added to the signal path. Only one diode added to the power supply circuit. We consider this a “must have” to protect your vintage amp. It will greatly extend tube life and reduce harmful inrush currents that degrade components throughout the amp, including tube filaments, capacitors, resistors and your unit’s power switch. Also slows application of high voltage upon start to increase tube life. Nothing is added to the signal path. We have extensive radio engineering experience. plus all the equipment necessary to critically align your receiver, including the FM stereo multiplex section. We fine tune the unit to improve selectivity, sensitivity, separation between channels and maximize sound quality. The result is performance superior to factory fresh. Improve tube connectivity and alleviate issues related to poor tube connections. Tube socket springs loosen over time. Let us hand re-tension all your tube sockets to bring back the original performance and reliability of your amp. We found that ultrasonic cleaning removes tarnish from vintage tube pins. With careful application, we can remove years of built up tarnish from your tube pins and improve their performance. This covers cleaning the pins of all the tubes in your amp. True matching can only be done with a curve tracer. 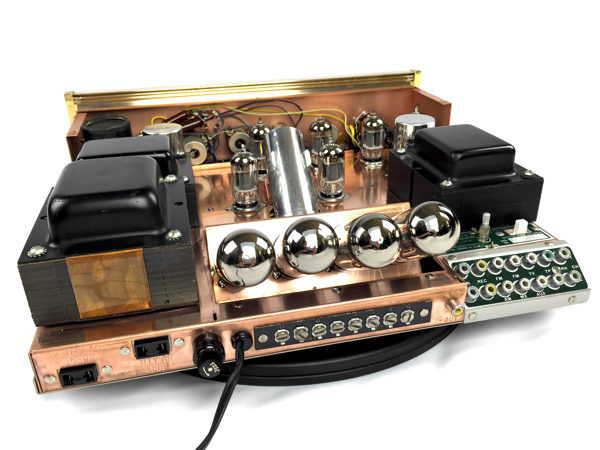 We utilize our Techtronix 576 curve tracer to provide you with a true matched pair of new tubes for your amplifier. We are an authorized dealer of the following tube brands: Mullard, Telefunken, Electro-Harmonix, Tungsol, Genalex Gold Lion, Svetlana, Sovtek, and JJ. 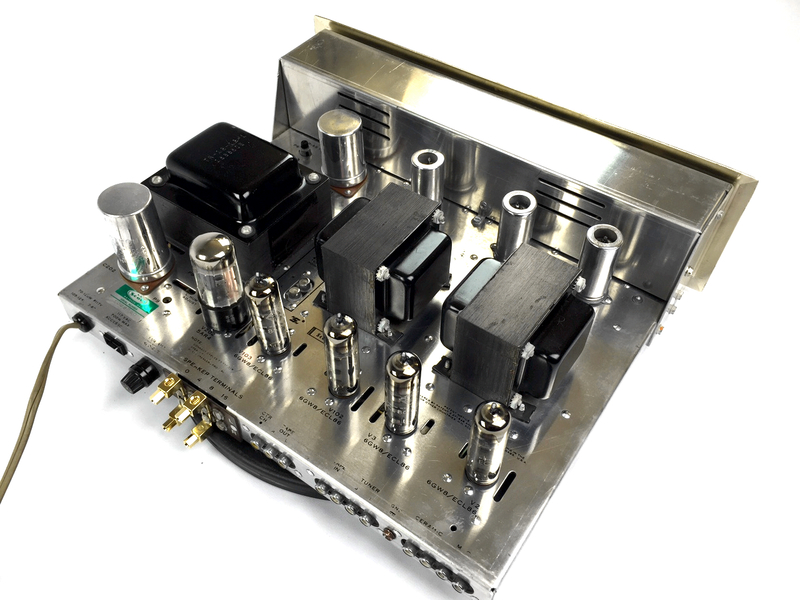 If your amplifier uses only rare vintage tubes, we can source and match a setup for you (may incur additional cost). Get vintage tube sound quality by matching tube your amp’s bias and screen voltages to match modern made tube types. Improve vibration isolation for your amplifier by replacing old and brittle feet. Or, if your amp has simply lost its feet overtime, we can replace them with new isolation feet. Let our expert tube knowledge and amplifier design experience match your tubes to your amplifier’s circuitry. Using our custom individual bias controls and a computerized spectrum analyzer, we set each tube’s bias and balance for not only lowest overall harmonic distortion, but also for the lowest odd-order harmonics. This critical adjustment makes all the difference. Full diagnostic Amplifier Performance Report of how your amp is performing (for sample click here). 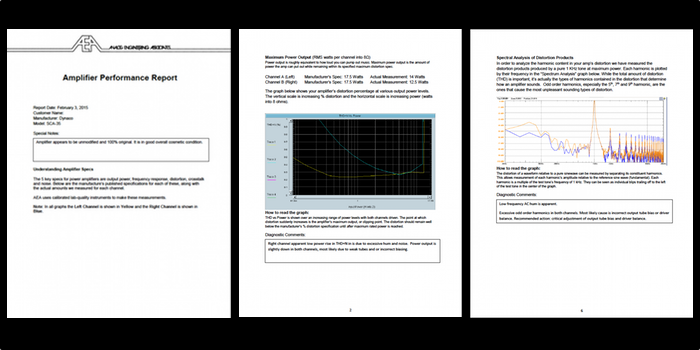 Report includes graphs of each channel’s frequency response, maximum power output, total harmonic distortion, spectrum analysis of distortion products, cross talk, and signal to noise ratio. Any needed repair work will be quoted on a case-by-case basis (channel out, broken switches, cracked sockets, etc.). Provide us with the dimensions of your amplifier, and we can build and send you a custom double walled shipping box lined with Styrofoam and full of bubble wrap. Feel safe knowing that your amplifier has ample protection from shipping damage. We will include a return shipping label for your convenience as well. Cost of the custom box is included, however actual freight charges will be added to your final bill. See our Gold Level Warranty for more information. Have questions about how our services will work for you? Our “sales@aeaaudio.com” email address is temporarily down, so please use the “AEAaudio@gmail.com” email address. Sorry!